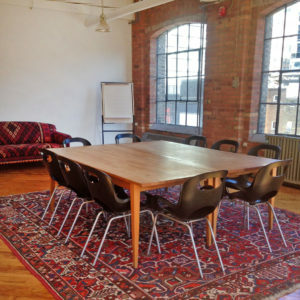 Looking for a space for your next meeting, workshop, or small event? Studio 303 is a bright and comfortable space on the third floor. It comes equipped with two large tables, chairs, WiFi, a projector, whiteboards, and a conference phone. 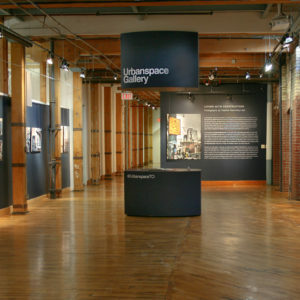 For larger events or lectures, please inquire about Urbanspace Gallery. Urbanspace Gallery has a capacity of 120 seated and is fully equipped with AV equipment and a projector for presentations. Chairs and tables are available for rent. Limited wi-fi available. If you have questions or would like to book this space please contact our Events and Communications Assistant, Amanda Stines at events@urbanspace.org or complete and submit an application form.